This is the cutest use of my felted bowls yet - as a nest for two little hand felted mice. 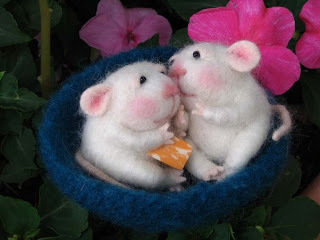 These mice were made by talented fiber artist Barby Anderson. You can purchase one of her creations, as well as kits and patterns if you want try hand felting yourself, on ebay or at her etsy store. That IS the cutest use of your bowls - and those are the cutest mice ever! I see your etsy store is doing very well and keeping you busy... congrats!